A University of Central Florida team of scholars has been awarded a $290,000 contract from the national Cemetery Administration (NCA), an agency of the Veterans Administration, to bring the stories of veterans buried in the Florida National Cemetery to life for a new generation of students. UCF is one of three universities selected to launch the NCA’s Veterans Legacy Program. 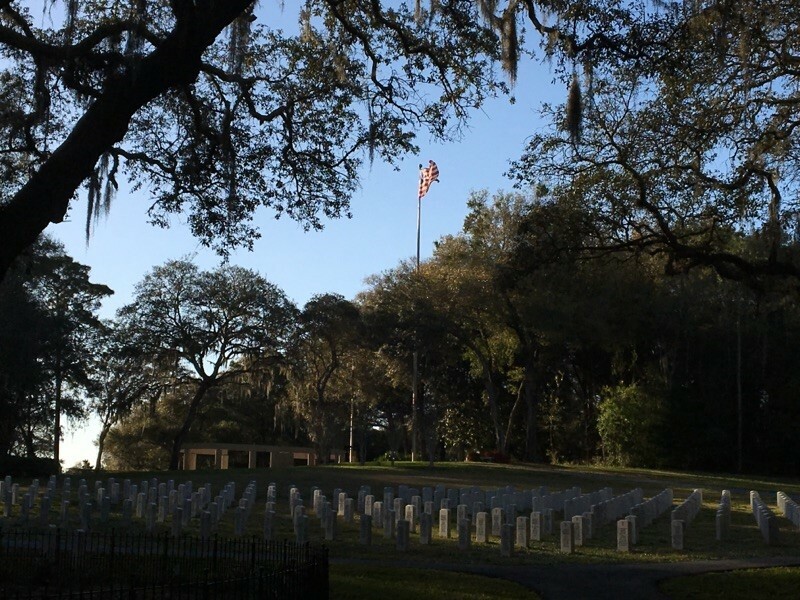 The project, led by Amelia Lyons, associate professor of history and director of graduate programs, will engage UCF students in research and writing of veterans’ graves and monuments. 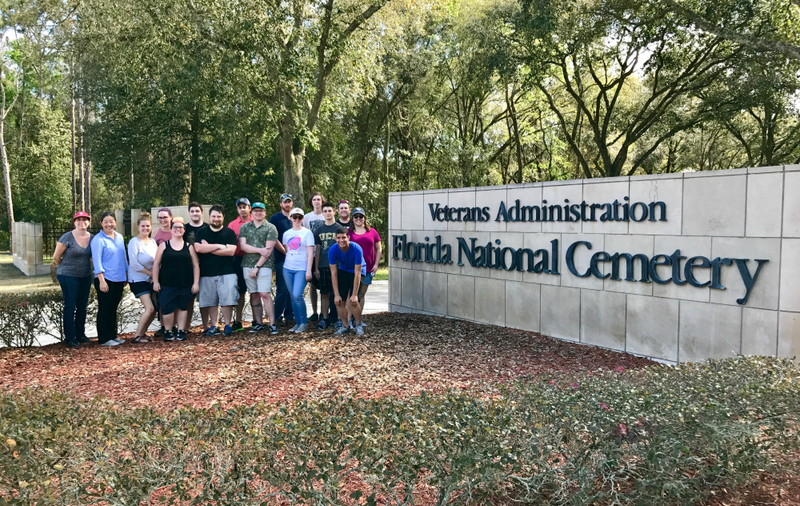 In addition, UCF faculty and students will collaborate with local Central Florida schools to produce interactive curriculum for K-12 students and organize a field trip to the Florida National Cemetery. Involving students of all ages in the project will satisfy not just the NCA’s goal of engaging the community with the service and sacrifice of veterans, it will give undergraduate and graduate students who take part a real-life lesson in professionalization, Lyons said. “This experience with primary research – from identifying the subject and stories, to analyzing the sources to produce a narrative, to editing and becoming a published author – is like no other,” Lyons said. The corresponding website exhibit, created by the research team, including Scot French, digital historian, Amy Giroux, a computer research specialist in UCF’s Center for Humanities and Digital Research (CHDR), and graduate student assistants, will use Visualeyes software to virtually map the research, and UCF’s RICHES Mosaic Interface ™ to create a digital archive. The Florida National Cemetery, located in Bushnell, is one of 135 cemeteries overseen by the VA in the U.S. Earlier this month team members visited the site to begin their research. Students, including those in Lyons’ “Modern Europe and the First World War” class and Professor Barbara Gannon’s “War and Society” classes are conducting research, searching for any documented history on the veterans whose graves will be selected. Undergraduate students are excited to participate in the project. Kristina Himschoot said, “the VLP is becoming more important to me every time I learn something new about it. My family history is flooded with men and women who have served in our military, my parents met in the Air Force, and both my grandparents served, so I have the utmost respect for this project.” Anson Shurr believes he will draw a deeper, more personal connection with our veterans as a result of conducting research in support of this project. “Seeing their graves in person, epitaph and all is personal enough, but once you realize that in many cases they lived in the same town or street as you, or you see a surname you know, it really hits home. They were people just like you; even your same age, that for one reason or another were called to put their lives and dreams on hold to fight in war,” said Shurr. Student and US Army Veteran, Kenneth Holliday reminds us of the “timeliness” of the VLP. He continued, “we are in the centennial of World War I, there is no better time to recognize the service of these veterans.” April 6 marks the one-hundredth anniversary of the US entry into the war. Graduate students in Professor Caroline Cheong’s “Seminar in Historic Preservation” course are helping to identify the graves and monuments to be included and are photographing the sites for both the webpage and the AR app. Scot French, associate professor and director of public history, is having students in his “Viewing American History in the 20th Century” class create interactive digital materials for use on the website and John Sacher, associate professor of history and liaison with public schools, is integrating the results of the project into K-12 curriculum that will ultimately be available for use in schools across the U.S.
Gannon, who is also coordinator of UCF’s Veterans History Project, said that because of UCF’s engagement with veterans and rich history in creating extensive interactive exhibits and web-based tools, the funding doesn’t come of a surprise. “We were made to do this project,” she said. Other schools selected by the VA’s National Cemetery Administration for award are San Francisco State University and Black Hills State University, for a total investment of $672,573.